More Dust Bunnies Are On the March! On sale in our CafePress shop now! A few months back, there was a comment that putting our marching dust bunnies on a bumper sticker would be a great idea. I missed that when it was first posted, but found it recently. It was one of those that is a terrific idea, why didn’t I think of it moments. 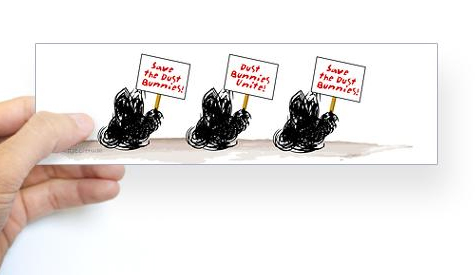 Today I had the opportunity to create the bumper sticker and the Dust Bunny Bumper sticker is now available in our CafePress shop as a single, a 10 pack or a 50 pack of bumper stickers. It is wonderful when people contact us through the website or our shops and ask if we can do something based on other things that we have. Many times those are good ideas for things that we can easily do, we just didn’t think of it. So we really appreciate suggestions and questions about whether something is possible. Some new products we create and occasionally a whole line begins with a suggestion or question from a follower or potential customer. We really appreciate hearing what people think or would like. Sometimes I’ve had beads hiding in a drawer waiting for an idea and someone’s question or comment about what they would like to see for jewelry or an accessory helps me to realize how the beads were meant to be used. So thank you all for being so wonderful asking questions, providing feedback and suggestions. We appreciate that so much! This is the story of Shadow and parsley. Rabbits are sometimes really weird for no explainable reason that we humans can figure out. Shadow had a bizarre reaction his whole life to parsley. When we would wash parsley and first put it down for him and Tigger, Tigger would dig in and eat it with no problem. Shadow would sniff it and run away and I do mean run away. If we picked up a piece of the parsley and took it to where he was and put it down in front of him, he would run away again. He acted as if it was something out to get him. After awhile, I began to picture it as Attack of the Killer Parslay. Eventually after the parsley had been down on the floor for a while, Shadow would eventually come and eat it. It was so weird though that he reacted with the terrified run away reaction every time it was first put down. Tigger and Portia did not have any parsley problems and Leo doesn’t now. We have no idea why Shadow was so upset by parsley at first each and every time. Okay, I swear sometimes the bunnies read the blog and Twitter feed. It was only a couple days ago I wrote about The Things I Do For Bunnies and how I really gag over the smell of Cilantro. Someone on Twitter asked if I really hated it that much and I replied that I found the smell of Tigger’s SBDs sweeter than the smell of Cilantro. Tigger’s SBDs tend to smell like a skunk has invaded. Last night, Blaine washed up a pile of Cilantro for the bunnies while I was working in the office. I came into the living room after the rabbits had finished eating. I got down on the floor and Tigger hopped over. She stopped right in front of me and yawned, sharing a cloud of Cilantro scented bunny breath. With Tigger, I do have to wonder if she was addressing me with bated breath wanting to know what smelled the worst: Cilantro, her SBDs or the new entry, her Cilantro breath. I have to admit, I fled the room so quickly that I am not sure where I would rate the Cilantro breath. However, I know I don’t need to try it again just to be able to fine tune that answer. I now have a completely new Haiku idea for the folks on IHateCilantro.com. If only I could remember how a Haiku is supposed to be written. Sigh … where is a good gas mask or respirator when you really need one. We created two bunny banana addicts. We didn’t mean to do it. We didn’t think we had done it, but we did it. Everything we read said rabbits liked bananas too much and they are too fattening for them. So we planned to make these a rare treat and not get them addicted. When Tigger and Shadow were babies, just months old, we had them spayed / neutered. Afterwards as a precaution, the vet wanted them on antibiotics. We didn’t want to try to hold them down for medication when they were recovering from surgery. So we had what we thought was a great idea to give them medicated “banana sandwiches”. We took small Asian dipping bowls and put a really thin banana slice in the bottom, squirted the medication on the slice and covered it with another really thin banana slice. Both bunnies were nice enough to eat everything and even lick the bowls. They took their medication, but in one short week, we created addicts for life. Fast forward to a few years later … Banana treats have been rare, maybe once or twice a year. We think they don’t remember those early days and that smooth banana taste and texture or the heady banana smell. Usually, we would eat bananas where Tigger and Shadow didn’t have access. However, one day I walk into the living room with a cereal bowl in my hand and the last bite of banana in my mouth. As soon as I sit down, I have a black rabbit bouncing on my lap inspecting my bowl. Shadow rapidly looses interest in the cereal and starts stretching up my chest, patting me on the chin with his paws, and sniffing my mouth. He is so close, his whiskers are tickling up my nose. It occurs to me that he can smell that last banana bite in my mouth and I’m supposed to give it over. I let Blaine know later that we need to be careful about our own banana use. My warning is forgotten and a couple of weeks later, Blaine walks into the living room with an evening snack for himself, a bowl of cereal with a cut up banana. He sits down on the sofa and is immediately overwhelmed with Tigger and Shadow bouncing all over his lap and trying to dive into his cereal bowl. It is amazing to watch two high energy rabbits bounce around so much and so fast they look like a pack of rabbits. After watching the show for a minute or so, I decide I had better respond to my husband’s howls for help. Fortunately, our pantry included some dried banana slices and I was able to lure our two addicts to another part of the room so that my husband could quickly consume his banana. The moral is that bananas and rabbits are a combustible combination. Watch yourself if you ever plan to combine the two! Addicts are easily created and humans are in danger if they ever try to keep a bunny addict from the banana. To enjoy a banana now myself , I have to sneak out to the garage, patio or lock myself in a bathroom. Blaine had an idea for a design: a line of hopping away hares called Receding Hare Line. I created a couple of versions of artwork. Later while looking at the bumper sticker options available in our CafePress store, I realized a single line of the receding hares would work as a bumper sticker. Get Off My Tail ! came quite quickly to mind for the wording. I really hate the tailgating traffic here in Atlanta that leads to quite a few accidents. Blaine and I have both been rear ended by drivers not paying attention. It also occurred to me that this could be really great on lockers or cubicle walls. You can send a message you are stressed out by too much supervision. We have this on a file cabinet where we store a lot of bunny supplies. The message would be for our rabbits if they could read, since they dance around us like crazy when we go into the cabinet to get something for them. This is currently our top-selling item in our CafePress shop. It is available as a single bumper sticker or in multi packs. So there are a couple of levels of discounted pricing available if you would like to purchase for a group or for resale. The Rabbittude Posse is our current Rabbittude brand art. You see the three bunnies here in our blog header and in the header we use most of the year for our Etsy shop. Tigger and Shadow were obvious choices for this since they have been with us so long. Portia was a sweet gray Chinchilla rescue rabbit we adopted. She lived with us for just three years. Then an unknown heart defect took her swiftly from us. Why do we call this Rabbittude Posse? They meet one urban definition: a group of friends, people who may or may not have your back. Tigger and Shadow have always had a strange relationship. You see bunnies in pictures all snuggled up together. They do behave like that much of the time, but they also like to spend a lot of time apart. Their relationship has been a bit on again, off again. They have never sought to harm each other, but they fuss with each other at times. They decidedly prefer to have separate cages when they need to be locked up. When travelling to the vet, they prefer to be together. They sit side by side in the carrier, one facing forward while the other faces back. You can read the body language that they have banded together as buns against the world. During their longest off time, we had a really stupid idea. We thought that bringing in a third bunny might be like bringing in a mediator. Shadow was prepared to be friends until Portia bit him on the nose. Tigger and Portia were hostile at first sight. We never let them come together. Shadow and Tigger did band together, against Portia who was quite happy to form her own bunny camp of one. We ended up with separate rabbit territories. Tigger and Shadow got the second and third floors. Portia got the ground floor. We humans were left navigating over and around multiple baby gates, making sure none of the rival rabbit gangs came together in a bunny rumble. Although the three bunnies never hopped together physically, they all shared the same Rabbittude. That is why we show them as a group in the artwork. 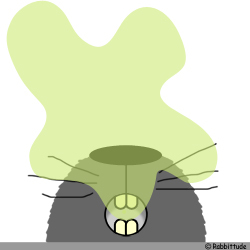 Early on with Rabbittude, many asked why we showed backsides of bunnies instead of cute faces. Ah, that would not speak of rabbittude. As prey animals, rabbits keep their eyes and ears sharply focused, always scanning for danger. When you see bunny behinds, you are officially being dismissed and ignored by a rabbit as being of no consequence. Usually, they are miffed. We have lost count of the number of times we have found ourselves telling a rabbit, “Don’t you dare turn your back on me!” That is usually followed by the rabbit giving a glance back over their shoulder with a sniff, before pointedly turning away again. Ah rabbittude! You can see the several versions of the Rabbittude Posse design on items in our CafePress store. In our Etsy shop, the Rabbittude Posse appears on an ACEO (Art Card Editions and Originals) print. Hello Bunny Twist. Both rabbits are haunting the kitchen and begging for food every time I set foot there to get a meal or snack for myself. So now everybody is on a diet whether they want to be or not. Granted, I need to lose some weight. However, I wasn’t planning on having a couple of rabbits as my diet buddies and monitors. So now we are all sharing the diet grumpies. No one is starving. It is the difference between having an open buffet and just a salad bar to choose from. If you are used to the open buffet, the salad bar seems like deprivation of the worst sort. Sigh… I hope we all reach better weights quickly. Looking back over the past ten years with Tigger has me thinking a lot of now and then. Recently paging through a book of Japanese crests, one just looked so much like a couple of lop eared bunny rabbits that it inspired me to create a bunny rabbit crest. Since I was thinking about then and now with Tigger and Shadow and I just really go for the bunny puns, the title for the design became Bunny Now and Zen.